One thing that has always fascinated but haunted me for a good duration of my life has been what exactly happens to us when we die. Do we just sit in that coffin and await the fate of nature to consume our bodies? Do our souls really travel to a Heaven or Hell? Or is there something out there that is interconnected with us that is in a galaxy far far away? There are a lot of questions that have no answers, because the dead can’t talk, and the smartest people in the world won’t even be able to decipher what’ll happen. It’s one of life’s greatest mysteries, but I don’t let it consume me. What we, as humans, obsess over is our own destruction. Humans are destructive, and as a young species, the fear is that we’re going to destroy our own world because we’re too self-absorbed in the world of technology, which takes away from the essentials of human life like growing food, cultivating crops, and sustaining a healthy Earth for future generations. So the question becomes now: if this Earth, which every other year is ‘doomed’ by some sort of conspiracy (Hello Mayans, I’m talking to you), were to experience a fate in which we couldn’t change, then what would happen? How would we sustain life After Earth? Where would we go? These are he questions that the Europeans probably asked themselves and relied on the bravest and most eager men & women to set out and discover a new world – in this case it’d be a new planet or Solar System. 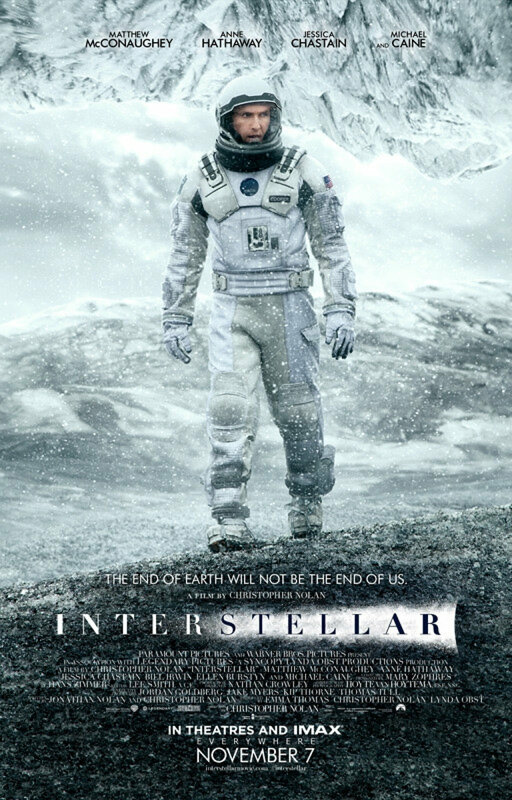 Interstellar sets up the story of what could happen. I was drawn to this movie because ever since Inception and the Dark Knight Trilogy was taken over by Chris Nolan, I’ve been a fan of his dark and mind-numbing (I wanted to use another word) ways to creep you out and have you questioning just what goes on in the world because he takes stories and creates mazes, which end up turning into Rubik’s Cubes, and ultimately you just say ‘forget it’ (also wanted to use another word) and hope for a moment that you can try to figure out what’s going on. That’s pretty much what my reaction was in this movie, but in a good way, because it’s great to be intellectually stimulated in a world where the crash, bang, and in-your-face gets all of the attention in the world. Astronomy has been a fascination of mine since I was a little kid, so it was just like that – bringing the kid out of me and bringing me into a fascination that was embodied in a question…What If? Matthew McConaughey has been on a hot streak with his Oscar win for Dallas Buyer’s Club, and a (what should have been longer) role in The Wolf of Wall Street. His charm and sense of humour will always be there to inflict that personality, but as an intelligent being who is also a dedicated father, whom his character Cooper portrays, there’s an extra element that plays a factor into shaping a great role. He was the focal point, as the world needed the bravest people to find a new hope for mankind. It would appear to be your simple story, but like space and the movies (Christopher Nolan ones in particular), there’s a lot of uncertainty and anything can happen at any given moment. Conspiracies with regards to space have been around since the days of Galileo and his telescope. How can we be so sure that there is inhabitable life out there for humans? How will we be able to move 7 Billion people on Earth to a new galaxy to inhabit? Nothing is for certain, but those were the type of questions that were asked in this movie that I found truly fascinating.